this soup is fall. literally, everything about it screams fall! right down to the beautiful velvety orange colour. 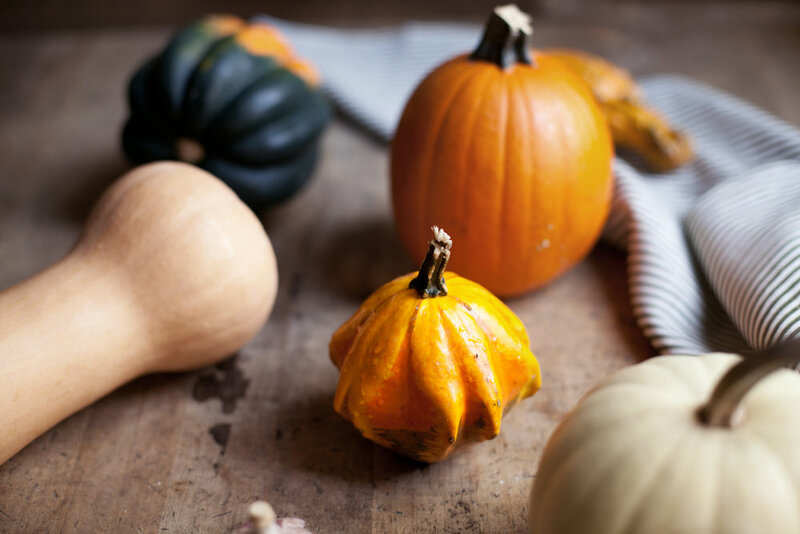 today i am teaming up with vitamix to share the recipe (as well as the most gorgeous copper vitamix) for this roasted pumpkin + butternut squash soup! i think everyone knows by now that if copper finish is one of the options for any kitchen item, i have to have it! i just finished putting up the open shelves in my kitchen this weekend (fingers crossed they hold) & decked it out in ALL the copper things i could find! so this vitamix looks gorgeous out on the counter next to the shelves. instead of just doing a classic butternut squash soup, i wanted to roast some pumpkin into the mix. i bought a ton of pie pumpkins this month because i can't help myself (they are so cute) & now that halloween is over i am putting them to use! i roasted both the butternut squash & pie pumpkin in olive oil, fresh sage & fresh thyme for maximum fall flavour. i asked my dad if he could bring me some fresh sage for their garden to my house for this recipe since i don't have an herb garden yet.. he brought every herb he could find because he didn't know which one sage was LOL! gotta love dads. this vitamix is probably one of the most amazing blenders i have ever used. it literally pureed this soup within seconds & left no chunky bits behind like i find most blenders do. what's left was a silky soup that i decided to drizzle with cream because it looks so pretty. it is stressful getting that photo perfect swirl though! BUT if you want to keep it vegan, just leave that last touch of cream out. on a lined baking sheet add the chopped pumpkin & butternut squash. toss with olive oil, thyme, sage, salt & pepper. roast for 1 hour or until the flesh softens. 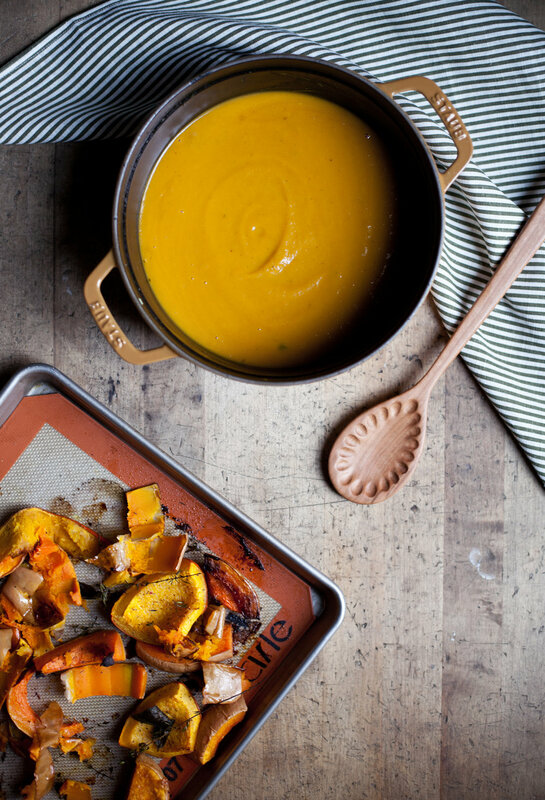 while the squash is roasting, prepare the soup base. in a large pot over medium heat add the additional olive oil, thyme, sage, garlic & onions. cook until the onions turn translucent. add the celery & carrots, cook for 5 minutes. season with salt & pepper. add the vegetable stock & bay leaf. let simmer covered for 30 minutes or until the vegetables are soft. remove the bay leaf & pour base into the vitamix. blend. remove skin from the roasted squash & pumpkin, add to the vitamix. puree until silkly smooth. if desired, serve with a touch of heavy cream. this post was created in partnership with vitamix! you can find the gorgeous copper vitamix here (christmas wish list season is coming). thank you for supporting the brands that keep me doing what i love!